Cold brews — the delicious coffee blends that were once an underground trend — have spilled over to the masses, and with good reason. Uniquely-brewed in limited quantities, the finely prepared drink offers coffee-lovers an artisanal experience that’s worth waking up early for. Announcing Dunkin Donut’s cold brew coffees, the premium cold brew coffees, making it the latest, in-demand menu item Boston can’t stop sipping. Here’s why premium, new menu item that’s in high-demand. The limited, hand-crafted beverage is specially prepared each day. Every small batch of this desirable iced beverage is finely-crafted and brewed to perfection. And with limited quantities available daily, there’s a reason the premium iced beverage is so desirable: Dunkin Donuts cold brews are carefully created using fine ground coffee beans that are steeped in cold water over an extended period of time, extracting the richest flavor possible for maximum enjoyment. Flavorful and delicious, the energizing drink is poured over ice and served to satisfy. Worth savoring, this exceptionally tasty beverage is intentionally brewed to produce a flavor profile that’s naturally sweet. The result? A delightful, full-bodied blend that’ll call for any coffee-lover to revel in its specially crafted nature that will impress until the last drop. Cold brews are easy to drink black. 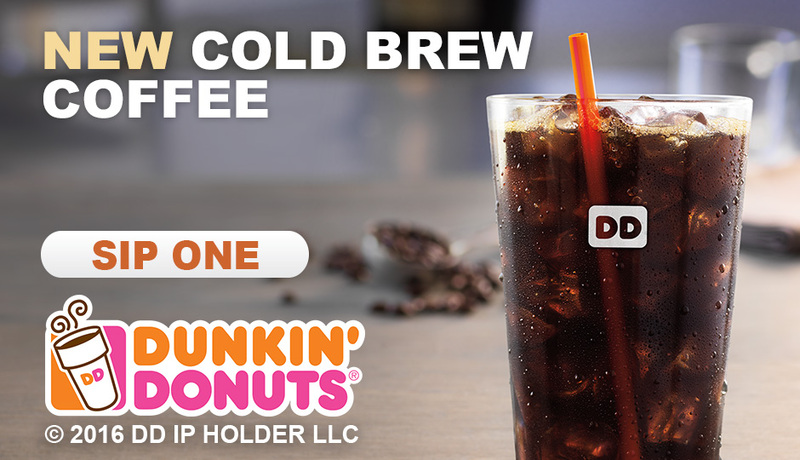 Traditionally enjoyed with no need for sugary additives, a cup of Dunkin’s premium cold brew coffee is smooth with a naturally sweet taste and easy to enjoy served black. The process it takes to achieve a cold brew as good as this should not be taken for granted. Ready to run on Dunkin’s premium cold brews? Get yours before they’re gone. Start your day off right by ordering a cup of tasty cold brew while they last: remember, given the small batching process in which cold brews are made, quantities are limited — and definitely worth setting the alarm a little earlier for. Visit your local Dunkin Donuts and try the premium new iced coffee option New England loves to sip.